HAJI Manan burped well last weekend. Not just from the lemang, ketupat and rendang, but also from the number of visitors who went to his mosque’s open house in Behrang Ulu, Perak. The mosque was built in 1954 on a piece of land donated by a villager. The mosque has seen several changes and is today well attended for Friday prayers. For many years, it was the only mosque serving several villages in the district. Last Sunday, Haji Manan and his mosque committee broke new ground when they hosted a Hari Raya kenduri for the whole village, including non-Muslims. In many ways, it was a success that kept the kampung folks talking for days. 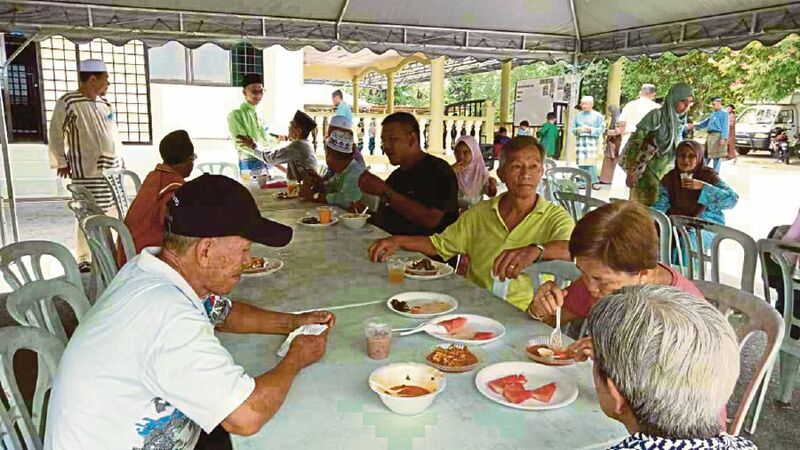 As the chairman of the village committee, Haji Manan got the idea of inviting non-Muslims to the mosque for a Hari Raya feast from another mosque. About three years ago, he and key officials from the mosque visited Masjid Saidina Abu Bakar As-Siddiq in Bangsar. Known widely as the Bangsar mosque, its committee, led by Datuk Ibrahim Thambychik, is well known for various community projects. It was among the first mosques in the federal capital to have opened its doors to non-Muslims for a Hari Raya open house. That initiative has won praise from many quarters, and has also moved Haji Manan and his committee to do likewise in Behrang Ulu, some 130km away. It was a small gathering compared to the one at the Bangsar mosque, but it was meaningful in more ways than one. community at large. Most mosques raise their own funds. The hat is passed around every Friday when there’s a big congregation. Depending on the time of the month and the attendees, the weekly collection ranges from RM1,000 to RM1,500. The average weekly collection for the Behrang Ulu mosque is about RM1,500. The funds are used for part of the mosque operations and any other community initiatives it deems fit. So it took a fair bit of time for Haji Manan to get his committee members to agree to organise the event. Judging from the early feedback, this open house for everyone in the community, including non-Muslims, is going to be an annual affair. Haji Manan gave his account: “I’m very encouraged by this event. This is the first time we are having this. That visit to the Bangsar mosque has really helped me and my committee members. It is such a simple idea and should have been done much earlier. Tanjung Malim member of parliament Chang Lih Kan made a surprise stop at the open house. Haji Manan is on his left. “Once it was decided, my committee members wasted no time in getting things organised. We made our own lemang and rendang. The kampung folks make some very good rendang and lemang, mind you! “We spent days getting things organised. The womenfolk put their weight behind us too. When the day came (June 24), everyone came in their Hari Raya best. We opened our doors from 2pm, giving enough time for the committee to set up tables and organise the buffet lines. “The last guests came all the way from Kuala Lumpur and left the mosque around 6.30pm. It was a very satisfying day for me and my committee members, especially with the presence of our non-Muslim neighbours. “We wish there would have been a bigger participation from our non-Muslim neighbours. But we made a mistake with the invitation, something which will be corrected in time for the next one. Indeed, the open house was an eyeopener for everyone in the kampung. They had taken many things and many people for granted. This open house broke new ground in relationship engagement and should be replicated by other mosques. Haji Manan is already planning the next multi-racial open house at the mosque — a kenduri rakyat on Hari Raya Haji which falls one week before Merdeka Day. I hope they have some dodol this time around!